Sergey Korolyov | See you in Ukraine! Sergey Pavlovich Korolyov — the Soviet scientist, the designer and the organizer of production of space-rocket equipment and the rocket USSR weapon, the founder of practical astronautics. S.P.Korolyov was born on January 12 1907 in the city of Zhitomir in a family of the teacher of Russian literature of Pavel Yakovlevich Korolyova and Maria Nikolaevna Moskalenko. In school days of Queens started to be interested in new then aviation equipment, and showed to it special talents. In 1921 its acquaintance to pilots of the Odessa hydrogroup took place. Since the same time he began to participate in aviation public life actively: since 16 years — as the lecturer on aviailliteracy elimination, and with 17 — as the author of the project of glider K-5 officially protected before the competent commission and recommended for construction. In 1924 of Queens arrived in the Kiev polytechnical institute on a profile of aviation equipment. In only two years it mastered in it the general engineering disciplines and became the athlete-glider pilot. In the autumn of 1926 Sergey was transferred to the Moscow highest technical school (MVTU) of a name of N. E. Bauman. Even in days of the study S.P.Korolyov received popularity as the young capable aircraft designer and the skilled glider pilot. In September, 1931 of Queens together with the talented enthusiast in the field of rocket engines F.A.Zander achieved creation in Moscow public organization — Group of studying of jet movement which in April, 1932 becomes on the substance of the state scientific and design laboratory on development of rocket aircraft in which the first domestic liquid ballistic missiles (BR) GIRD-09 and GIRD-10 are created and started. On August 17, 1933 the first successful rocket firing of GIRD was carried out. In August, 1946 S.P.Korolyov started to work in Kaliningrad in which it was appointed the chief designer of ballistic missiles of distant action and the head of department No. 3 NII-88 on their development. 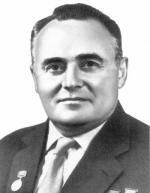 The first task which the government put before S. P. Korolyov as creation of analog of the Fau-2 rocket from domestic materials was the chief designer. In 1948 S.P.Korolyov begins flight and design tests of the R-1 ballistic missile and in 1950 successfully hands over it on arms. Only in one 1954 of Queens at the same time works over various updatings of the R-1 rocket (R-1A, R-1B, R-1B, R-1D, R-1E), finishes work over R-5 and plans five its different updatings, finishes difficult and responsible work on the R-5M rocket — with a nuclear fighting charge. In 1956 under the direction of the Queen the first domestic strategic rocket which became a basis of a rocket nuclear board of the country is created. In 1960 on arms the first intercontinental R-7 rocket which had two rocket steps arrives. It was S.P.Korolyova's victory and his employees. On October 4, 1957 under the direction of the Queen the artificial satellite of Earth first in the history of mankind was started into a circumterraneous orbit. Its flight made stunning success thanks to what the Soviet Union received high international authority. On April 12, 1961 S.P.Korolyov again strikes world community. After creation first-ever yapilotiruyemy space the ship "East-1", it realizes first-ever flight of the person — Yury Alekseevich Gagarin on a circumterraneous orbit. After Yu.A.Gagarin's flight on August 6, 1961 Herman Stepanovich Titov by the ship "East-2" made the second space flight which lasted one days. On March 18, 1965 during flight by the ship "Rising-2" with the crew, consisting of two people, cosmonaut A.A.Leonov first-ever makes extravehicular activity in a space suit via the lock chamber. Developing the program of piloted circumterraneous flights, Queens starts to realize the ideas about development of a piloted long-term space station. Sergey Korolyov was the generator of many extraordinary ideas and the primogenitor of outstanding design collectives which worked in the field of space-rocket equipment. Its contribution to development of piloted astronautics is the extremely powerful. Queens was the pioneer of many directions of development of rocket arms and space-rocket equipment. In 1966 the Academy of Sciences of the USSR founded a gold medal of a name of S.P.Korolyova «For outstanding merits in the field of space-rocket equipment». His name the Samara State Space University, the city in the Moscow region carry, streets of many cities, two research vessels, high-mountainous peak on Pamir, the pass on Tian-Shang, an asteroid, талассоид on the Moon.